This entertaining and informative 17-minute video is used for patient and staff education by thousands of health care professionals nationwide. Use this video in women’s centers, physical therapy, continence clinics, urology, ob-gyn and long-term care. The program reviews the urinary system, defines urge and stress incontinence, teaches pelvic muscle (Kegel) exercises and explains bladder training. Behavioral treatment methods such as those explained in this video should be tried first in many cases of incontinence according to the guidelines of the Agency for Health Care Policy and Research (AHCPR). This award-winning resource is excellent for community education meetings. As a rehabilitation nurse with 20 years of experience, I found the video to act as an excellent update and refresher. The program has many strengths. The information is current and presented at a basic learning level. The format is professionally discrete, presenting the facts in clear laymen's terms using points of reference that the viewer can relate with. Settings that might consider using the video would be acute inpatient rehabilitation hospitals, outpatient incontinence clinics, staff educators, physical therapy, home health, long-term care, assisted living facilities, private adult care homes and family practice settings. This 17 minute program is appropriate for both patient and staff education. Review excerpt, Rehabilitation Nursing (the official journal of the Association of Rehabilitation Nurses) Sept/Oct, 2003; Vol. 28, No. 5. As engaging, creative and well-made as any video I've seen in some time. Its chief virtue is that, from the outset, it is well-designed both creatively and instructionally. Adding to this strong framework is an effective and professional production style. The content is current, and the patient teaching, particularly the section on Kegel exercises, is done very well. Review excerpt from the Journal of Biocommunication, Vol. 22, No. 2, 1995. Excellent graphics and clearly depicted patient scenarios highlight this exceptional program. Review excerpt from Ostomy / Wound Management Journal, July/Aug. 1994. 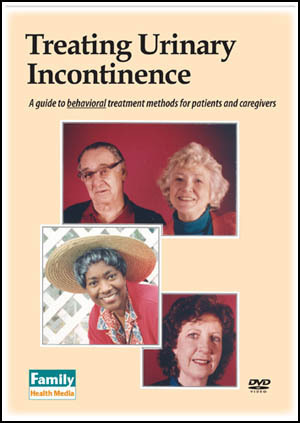 This video provides clear and accurate information about the causes of and behavioral treatment methods for urinary incontinence, offering hope for those dealing with the problem. The content and various teaching strategies used (animation, demonstration, real people) result in a reassuring and positive approach to the topic and an enjoyable 17 minutes of viewing. Review excerpt from The Gerontologist, Vol. 35, No. 3, 1995. This program takes a fresh, new approach to patient teaching. It is well-paced and is on an appropriate level for its intended audience. Presentation is clear and logical, and speakers are articulate. Review excerpt from Media Profiles, Vol. 21, 1994. This simple and straightforward program is ideal for men and women (both client and provider) being introduced to behavioral treatment methods. Urinary incontinence can be a sensitive subject. This reviewer would recommend the purchase of the video as an adjunct educational tool. Review excerpt from The Journal of Nurse-Midwifery, July-August, 1995. Reviewed and recommended by Elizabeth Noble, Physical Therapist; founder of the Ob/Gyn special interest group of the American Physical Therapy Association. Explain that the video applies to women and men with urge and stress incontinence. Message of hope - urinary incontinence is treatable. Behavioral methods are safe, have no side effects and work for women and men. Basic review of how the urinary system works. Define urge and stress incontinence. List some of the common causes of incontinence, such as childbirth, or prostate problems in men. Explain that medications and surgery are important treatment options, but that behavioral methods often should be tried first. Step-by-step explanation of how to do pelvic muscle exercises (Kegel exercises). Show biofeedback methods as a way to assist with learning pelvic muscle exercises. Step-by-step explanation of how to do bladder training. Explain importance of using the voiding diary. Recommends dietary changes to help manage urinary incontinence, including limiting the use of caffeine and alcohol. Discusses importance of drinking sufficient water. Explains that patients with urinary incontinence should talk to a health care professional to find the cause and best treatment. Mentions that behavioral treatment methods can be effective for many women and men. Reminder that medications and surgery are also available to help manage incontinence. Program synopsis Interesting graphics and clear explanations make this program a pleasure to watch for women and men alike. Reviews the urinary system. Defines urge and stress incontinence. Teaches how to do pelvic muscle exercises. Explains bladder training. Recommends basic dietary adjustments. Suggested uses Patient education. Continence clinics. Women’s centers. Nursing schools. Urology. OB-GYN. Wound, Ostomy & Continence nurses. Physical therapy. In-house TV channel. Community education meetings. Awards & recognition Award winner. World Congress on Biomedical Communications. 1994. Patient education category, 3rd place. Price $99 (extra copies, $59 each). Available for free preview? Yes, to health care professionals.